Every sport tries to say they have it. Parity is the word that means you have achieved ultimate sporting success. There is true competition amongst the teams in your league. But really… so far as I can tell… only the NHL has achieved such a thing. 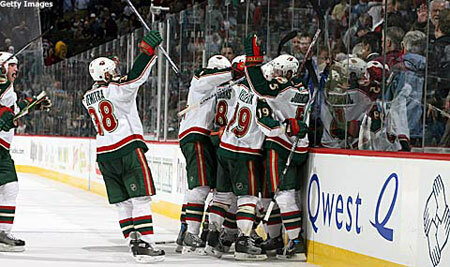 Proof is in the series between the Minnesota Wild and the Colorado Avalanche. First, they are the 4 and 5 seeds in the Western conference. That means they were the closest to each other in points. They are a great matchup on paper. But then, you have the actual games. Each of the three games so far has ended 3-2… in overtime. Including last night’s game. Minnesota has a 2-1 series edge, but I fully expect a 3-2 OT win for Colorado the next time they play. This series is great! Some other great first round matchups include the Caps and Flyers, Flames and Sharks, Rangers and Devils, Bruins and Canadiens… well, really.. ALL of them! The defending champs (Anaheim Mighty Ducks) are down 2-0 in their series, but I wouldn’t expect that to continue… that should end up a great series as well. So if you have Versus (a cable TV network) they are showing two games every night, and they have some great coverage between periods and after the games. NBC is carrying games on weekends. I think. NHL Playoffs are here, and it is the #1 sports spectacle in all of pro sports! Enjoy it while it lasts!